We all “know” that reviews are important to our online marketing efforts. But just how important are they? Many businesses fail to take full advantage of their reviews to increase their online presence and improve conversions. Don’t miss this opportunity. It can give you a huge leg up on your competition. This article is the first of two that will highlight 10 ways you can use reviews to grow your business. It’s tempting to see the emphasis on proximity in local search as an obstacle to local SEO for your business. 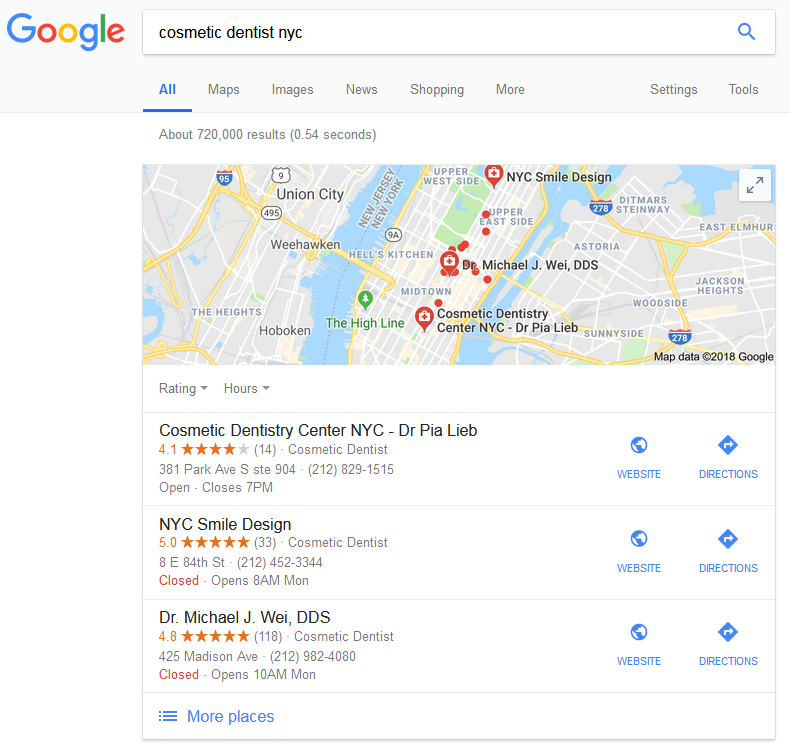 Although the value Google places on proximity to the searcher for Local Pack results is undeniable, you don’t necessarily need to uproot your office in order to compete. If your business is not in what Google considers to be the center of your city, you may face a disadvantage in local rankings. However, earning a lot of great reviews, implementing some smart SEO strategies, and boosting your credibility on-site and off-site can enhance your local presence in other ways. Google itself gives you a platform (Google My Business, or GMB) to tell potential customers all about your business. Among other things, a fully-optimized GMB listing will positively impact your local SEO results. It is free and it has robust features to help you engage users. Name, address, and phone number fields are just the beginning with GMB. You can link to your website and post special offers. Google even tracks lead generation for you. In addition to giving you a way to identify your business and allow potential customers to contact you, it also gives your customers a way to share their experience with you and other users. Customers can assign a star rating and write a review on your GMB listing. These ratings and reviews are included in Local Pack results, so you need to pay attention to the average rating, how many reviews you have, and what customers are saying about your business. TIP: Institute a systematic protocol that encourages all of your customers to share their experiences with your business by posting a review on GMB and other prominent review sites. Learn more about review marketing and online reputation management. When it comes to Local Pack listings, proximity to the person searching is going to affect which businesses show up. However, 5-star reviews and lots of them are one of the biggest reasons that potential customers click on your business listing in search results. A study by BrightLocal finds that star rating is the foremost factor customers consider when searching for a local business. Businesses with a 5-star rating get the most clicks, with click-through-rates declining with every loss of a star. In fact, businesses with no reviews (and thus no stars) get more clicks than 1- and 2-star businesses. This signifies that consumers are more willing to trust a virtually unknown business than one with a bad reputation. So, if your business has a high average rating from customers, you should receive more engagement with your Google My Business listing, more clicks to your website, and more leads. Searchers can’t miss the businesses in the Google Local Pack. However, they also look at organic search results. Because customers find them so useful, review websites frequently appear on the first page of results for services “near me.” By getting a lot of good reviews on many different popular websites, you increase the likelihood that a potential customer will see your name and add you to his or her shortlist of well-regarded providers in the area. In addition, third-party review websites use different criteria than Google to determine which businesses are “in” a city. Many searches on these site also give users the options to sort results by X miles of a location. These factors increase the likelihood that your business might be included in “local” results for a given location on review websites, even if the Google Local Pack doesn’t extend you the same consideration. TIP: Different customers will be familiar with different review sites. If a customer is more comfortable posting a review on Facebook or the BBB rather than Google or Yelp, make it easy by providing him with the appropriate link. Prospective customers notice positive reviews. Just like reviews posted on third-party websites, a positive review (or testimonial) on your own website increases the credibility of your company. In fact, if you bolster your search presence with online reviews from third-party websites and also add testimonials to your website, you create a consistent user experience and increase the likelihood that a person browsing your website will convert into a lead. When developing websites for our clients, Page 1 Solutions often excerpts testimonials and creates review galleries to showcase customer feedback. Customer reviews can be integrated into your website design, or you can embed widgets that display the latest reviews from a select external platform. The key is to generate these stellar reviews on a consistent basis. Instituting a system in your business process and using a reviews and ratings platform gives your business the framework to do just that. TIP: Be creative when integrating reviews into your website design. A review excerpt featured prominently on the home page can grab a visitor’s attention, while augmenting the contact form on internal pages with a reviews component gives potential clients a push to contact your business. In a service business, the skill and experience of your team combined with their desire to help each customer get the best possible results helps you deliver 5-star service. Customers love to talk about their experience, but it often takes a push to get them to do it online. That’s where a reviews and ratings platform can help, especially when it is incorporated into a process that encourages customers to give feedback. Successful ratings and reviews marketing creates a positive feedback loop that benefits your business and your customers. Happy customers are satisfied with their experience and feel good telling others about it. Potential customers are more likely to convert when they see these positive reviews. When they do, your business generates leads and revenue, enabling you to provide 5-star experiences to more customers. And the cycle continues. TIP: Don’t reward customers for positive reviews. That violates the guidelines of most review websites. Reviews are like word of mouth referrals, and good word of mouth can lead to great success for your business. Positive reviews and a high star rating don’t happen by accident, which is why investment in reputation marketing is a wise choice. Reviews marketing platforms provide a sustainable way to cultivate customer goodwill and build a strong star rating. But you must also lay the groundwork for your business by leveraging the best practices for local SEO, expanding your reach in organic rankings with third-party review sites, and enhancing your website user experience with testimonials.